All I can say it is has been an extremely busy 2014 so far in the real estate business. I have not been able to make myself sit down and write up an update to this blog. Every week, Every day has been non-stop trying to keep up with the demand. Demand for appraisal work and for sales work and often juggling both can be tricky. Both disciplines have specific time frames to work with. Buyers and sellers want immediate responses and while clients looking for appraisals are always on a limited time budget. Above: Incredible New Price on a harbour front 1.8 acre parcel in Little Harbour. $200k for a beautiful piece of paradise. It has beach, deep water for a dock, and 40′ elevations, it has it all except that pesky electricity supply. Speaking of Appraisal work – there has definitely been an uptick in appraisals services volume which indicates that a) credit is become more available and mortgages are become easier to obtain and b) consumers of real estate and loans are expressing more confidence in the economy. Typically you would not borrow money if your financial future was looking poor right? I will mention that the commercial banks in the Bahamas have severely clamped down on appraisal standards and lending requirements here. In the past a simple cost/replacement calculation would have sufficed to justify a value estimate however now every local bank is requiring that at least 2 comparable sales are included in the analysis and used to justify the final number reported. In some ways this is a good thing for our market, it is a maturation of the lending and mortgage business here partly as a result of the implementation of the Bahamas MLS. On the other hand it means value estimates are generally lower than they were in the past and less subject to the ‘interpretation’ of the appraiser. In any event higher reporting standards will benefit everyone in the long run. How is the Abaco Real Estate market doing these days? 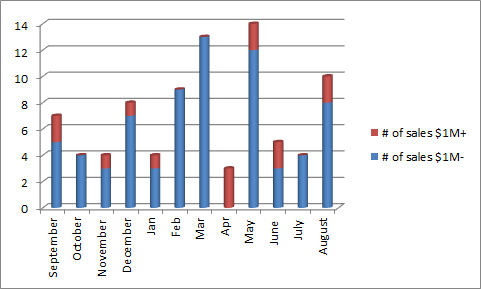 Well I’ve pulled up some sales activity numbers from the MLS which give a pretty good snap shot of the past year. Everyone is aware that the South Florida real estate market saw a strong bounce back and return to positive appreciation about 2 years back (2012). We expected it to happen in the Bahamas last year however while 2013 saw a little improvement, appreciation was stagnant. 2014 appears to be seeing a similar flat line in property values but that is a good thing, certainly better than a declining market. Steady markets are good, they are reliable, predictable and safe. Excessive appreciation is often a bad thing leading to a correction as we have all seen about 5 years back. You can see at the end of 2013 there was a steady transaction rate of 2-6 which is reflective of the whole of 2013 and typical or 2012 also. You will notice that as of February, there was a marked improvement in sales volume. You will also note the modest increase in sales of properties over $1M. Interesting to note – In a previous post I wrote about the busiest month of the year for sales activity, and April is typically one of the best for real estate both in the Bahamas and in the United States. But for some reason this past year, April saw a huge drop. I will have to look into what happened in April this year. Additionally, August is typically one of the slowest months of the year for sales, but this year is looks like it is one of best of the year. All in all, I have strong confidence that the market in Abaco is back on track and we will see some good but steady growth this coming year. That confidence is supported by several factors at play that will return Abaco and the Cays back to a strong yet sustainable growth level. Treasure Cay is supposed to have a new managing partner coming on to take over and rejuvenate the community. The area sorely needs some new energy to revitalize and upgrade. It is a shame because the community has such tremendous potential but is being held back in my opinion. Winding Bay, The Abaco Club is set to have new management and ownership coming October. The Abaco Club has been struggling to realize its full potential for the past couple of years and property owners have seen the value of their investment erode away substantially. With the pending take over by Southworth, out of New England the area should see a substantial upgrade and corresponding improvement in property value. I have confidence they will be the right fit and benefit all of Abaco. The new Marsh Harbour International Airport (MHH) has been operational for some time now and is an immense benefit to the island and offers a clean, efficient and air conditioned space for travelling to and fro. Now we just need direct service from Atlanta by Delta or even perhaps direct service to New York. It is a beautiful building and gone of the days of sloshing through mud to get to your car or taxi. The Hope Town Inn & Marina has been open for over a year and they have seen tremendous approval by the market. The marina is always very busy, and the rooms are on constant turnover. The property is attractive, convenient and becoming a staple of the Hope Town scene. Great Guana Cay maybe seeing some big things coming on stream soon, but more to come on that later. Unfortunately Green Turtle Cay is still struggling a little in terms of visitors, but this is proving to be a positive aspect for the second home owner market. Folks are finding the quiet and peace away from the busy tourist action the ideal spot for a quaint second home. The old New Plymouth Inn is ready for new life and would be a wonderful retirement project for the right person. It has lots of history and character and would be a ton of fun to return to it’s glory days. Lastly, my 2 cents – A house painted white seems to have serious trouble selling in the Bahamas. I suppose it is the only colour to paint a house in certain parts of Greece but it does not seem to work here. Anecdotally, there are several bargain homes on the market in Abaco that have been sitting for a good long while and I attribute it to the colour of the house – white. Similarly unpainted cedar siding seems to be equally difficult to sell. Happy back to school and International Literacy Month, And Coastal Cleanup Month!